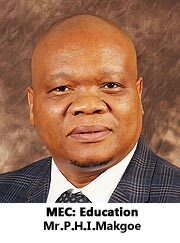 The MEC for the Department of Education in the Free State, Mr. Pule Herbert Isak Makgoe, was born on 12 May 1963 in Tumahole, Parys. He received his primary schooling in Tumahole and his high school education in Residensia, Sebokeng. While a student in his hometown he joined the Tumahole Student Congress.A Chemical Engineering graduate from Technikon Vaal Triangle, Makgoe holds a Bachelor of Commerce degree from the world renowned University of South Africa (Unisa). He later obtained an Honours degree in Bachelor of Commerce from the University of the Free State and a Master’s degree in Business Leadership from Unisa.As a university student, ‘Tate’ as he is affectionately known, was acutely aware of the delicate and volatile political landscape in the country owing to the draconian apartheid policies. On the instruction of the now-defunct United Democratic Front (UDF), the young Tate Makgoe left South Africa in 1984 to join the African National Congress’s (ANC) military wing, Umkhonto we Sizwe (MK), in exile.Makgoe has devoted his life to the disadvantaged and marginalised in order to fully realise the objectives of true political transformation and the total eradication of grinding poverty. Between 1986 and 1991, he was incarcerated in Sun City Prison for political activism. Following the unbanning of the ANC, Makgoe became the Northern Free State Regional Executive Committee Member in 1991. In 1994, he was appointed as the ANC Election Campaign Manager in the Free State. Between 1998 and 2001, he served as the Provincial Treasury and a Member of the Executive Committee of the ANC in the Free State. He is currently a member of the Provincial Executive Member of the ANC in the province. In the subsequent years, Makgoe, one of the long-serving Member of the Executive Committee and Member of the Provincial Legislature in the Free State, was appointed as a Member of the Free State Legislature (1994-1999), Free State MEC for Finance (1994-1996), Free State MEC for Tourism and Environmental Affairs (1997-1999), Free State MEC for Agriculture (1999-2001), Chair of Chairs in the Free State Legislature (2001-2004), Free State MEC for Public Safety, Security and Liaison (2004 -2005), and Free State MEC for Finance (2005-10 May 2009). Makgoe believe in the vision of a better life for all. He is driven by the quest for the total eradication of poverty and underdevelopment. He is married to Ivy and they are blessed with three children – Palesa, Maki, and Junior.